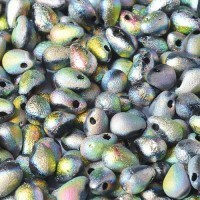 A string of 25 side drill tear drop beads in Etched Jet AB Full colour. These Czech Etched Vitrail Drop beads are used in many ways to add drama, interest and definition to your beadwork. They are perfect for finishing off your designs with a fringe, picot stitches or netting. When used in Spiral stitch, Chenille or other tubular stitches they can add fantastic texture and depth to your beads. And if Bead Embroidery is your thing, then Drop beads create rich surface embellishments whenever they are used. 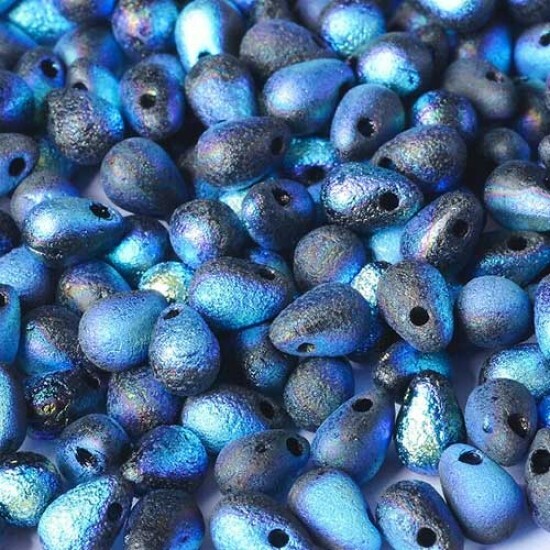 These etched drop beads are top-drilled with a bulbous bottom that catches and reflects the light beautifully. 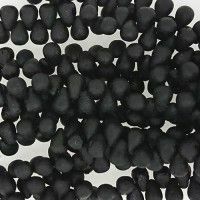 Measuring 4x6mm each, and supplied in strings of 25 beads, they are the best way to take your beads to the next level.